I always receive e-mails concerning subject beyond my knowledge to reply. I express regret at not being able to help. But I sincerely believe that it must be somebody somewhere who can help. With the permission of the sender, I put the e-mail on this Web page, to see whether anyone who can help on the Web. If you want to share your knowledge and enthusiasm in the topic, feel free to contact the sender directly or send e-mail to me. I have placed below some e-mails which are self-explained. Subject: It may be some sort of Chinese gaming piece. Some time ago you were able to assist me in identifying a Chinese coin I found on a New South Wales Goldfield. I have recently unearthed an object from the same general area which I am trying to identify. I am hoping that you might have knowledge of the object in question. I have attached pictures. It is circular and most likely made of lead, weighs 28.7 grams and is approximately 38mm in diameter x 4mm thick. It appears to have Chinese writing on one side but this is faint. One theory is that it may be some sort of Chinese gaming piece. I would be most grateful if you would examine the object and give me your opinion. I am not sure you are the one I need to ask this question but if not maybe you will know. I am looking for an old chinese coin dated from mid 1600s to early 1700s. The story of this coin is. I was having an old Martial arts (Shi Lum) formula translated and one of the ingredients I was told was 7 coins crushed up. The story behind the coins I was told was the government gave the herbalists permission to use part of a meteor that fell in China to use in thier herbal formulas. I am wondering do you know or know of anyone who may know if these coins are still around. And if they are, are they reasonable to buy. Any help you could possibly give me on these coins either more hisrtory a picture or anything would be of great help. We are trying to recreate as many of Mew Hings formulas as possible for a MA museum. First Shi Lum (spelling may be wrong but that was the name for the Shaolin Temple or so I have been taught.) Mew Hing was one of the 5 Monks that escaped the burning of the temple in 1644 (I think that was the year) The other monks were Fung Doe Duk, Bak Mei, Gee Shin Shim Shee, and Ng Mui the last being a female. Ng Mui was responsible for what is now called Wing Chun. Recently I found what I believe to be ancient money. I think it might be very old. Possibly from the South Pacific Islands. I am not sure. I have two pieces. 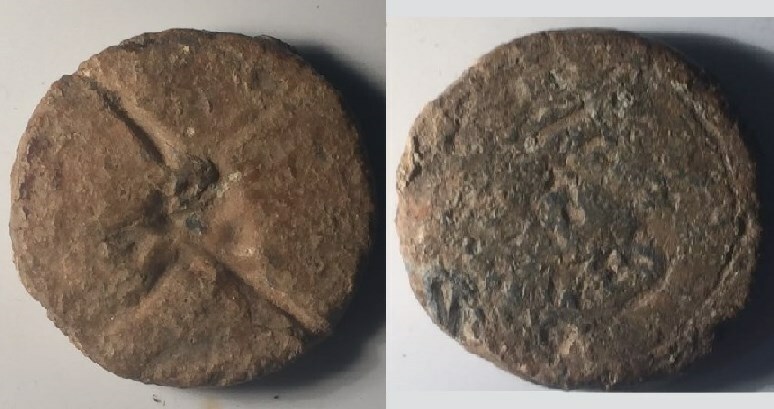 Both are round, the first one a little over 3.5 mm with a .6mm hole well worn on the edges, the outer edges of the coin are somewhat flattened (worn) on one side so that the thick part is left looking like a triangle. The opposite side is the same but the triangle is opposite the other side. It is jade and about .045mm thick. The second coin is thicker and (about .5 mm) and it is not as large (about 3.5mm) it has the same size inner hole and no triangle. The edges are very rounded and smooth from wear. Though this one is also jade, the jade is darker and seems to have deep dark pattern lines in it. The hole in this one is also very worn on the edges. I seem to remember in school that somewhere in the world, people used to string their money on strings and wear them around their neck. Vaguely, I think it was in the South Pacific islands... but it could have been China, BEFORE they began minting coins from metal. Can you please help me identify these coins? My e-mail address is billlog@palmnet.net us I'm not sure if the "us" is spaced behind "net" or if it does not have a space. You might try it both ways. In the event of a problem that you cannot get through, I also have another e-mail address as a backup. I would appreciate hearing your opinion. Thank you. I wish you and your family the very best of health and wealth.